The tote bag is made of 100% cotton, large roomy interior with measurements approximate 17" L x 14" H x 6" D, it is large enough to hold everything for day of event, and with a 21" reinforced fabric handle which is long enough for carrying over the shoulder. Great gifts for your wedding: Bride Gift, Bride to be gift, Bridesmaid gifts, Bachelorette Party Gifts, bridal shower wedding party gift bags and other milestone moments. Roomy : approximate 17" L x 14" H x 6" D, it is large enough to hold everything for day of event, and with a 21" reinforced fabric handle which is long enough for carrying over the shoulder. 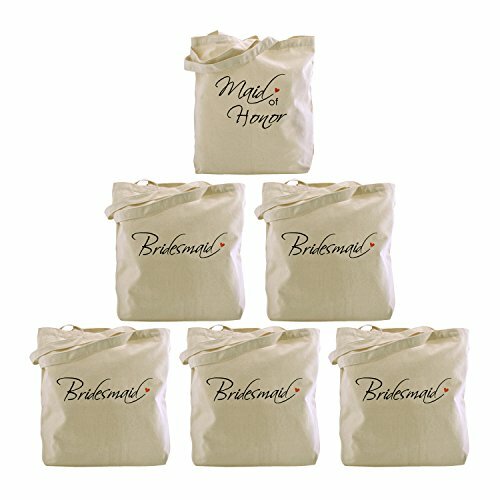 Great gifts bag for bride, bride-to-be, bridesmaid, bride's entourage and guests on the Bachelorette Party, bridal shower party, wedding party, honeymoon, getaway and other milestone moments. Friendly reusable tote bag after your wedding such as special artwork, library tote, grocery tote, food organization bag, shopping tote, travel cloth tote, or beach tote for outside. Made of 100% cotton, eco-friendly material, wash and care conveniently. If you have any questions about this product by ElegantPark, contact us by completing and submitting the form below. If you are looking for a specif part number, please include it with your message.